Cheap Muffins. 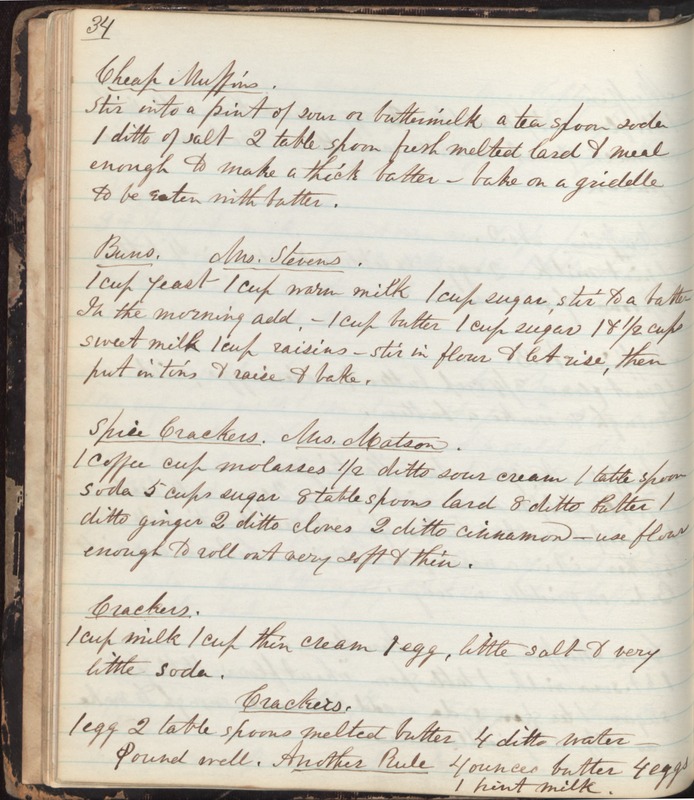 Stir into a pint of sour or buttermilk a tea spoon soda 1 ditto of salt 2 table spoon fresh melted lard + meal enough to make a thick batter - bake on a griddle to be eaten with butter. Buns. Mrs. Stevens. 1 cup yeast 1 cup warm milk 1 cup sugar, stir to a batter In the morning add - 1 cup butter 1 cup sugar 1 + 1/2 cups sweet milk 1 cup raisins - stir in flour + let rise, then put in tins + raise + bake. Spice Crackers. Mrs. Matson. 1 coffee cup molasses 1/2 ditto sour cream 1 table spoon soda 5 cups sugar 8 tablespoons lard 8 ditto butter 1 ditto ginger 2 ditto cloves 2 ditto cinnamon - use flour enough to roll out very soft and thin. Crackers. 1 cup milk 1 cup thin cream 1 egg, little salt + very little soda. Crackers. 1 egg 2 table spoons melted butter 4 ditto water - Pound well. Another Rule 4 ounces butter 4 eggs 1 pint milk.